Hello Friends, This is Odie reporting in from Ohio. We are excited to be home. Our home church, Dryden Road Pentecotsal Church, is celebrating 60 years on Dryden Road and 70 years as a church this week. I am glad Dad was able to work our schedule where we could be home for this special week of celebration! I want to wish you a Happy Easter! I am so thankful we serve a Risen Savior! He is definitely alive and still working for His children in 2017! If you are not a Christian, today is a good day for you to get to know my Jesus. He is amazing and He died for us. On the 3rd day He Arose from the grave! We had a fantastic week in Central City, Kentucky! It is always wonderful to be with Pastor Alan and Sister Tammy Harris and all our great friends at Trinity Pentecostal Church! I am so thankful God placed these friends in our lives. The services during revival were so good. The presence of the Lord is so sweet and precious! Thursday morning, April 13th, marked 3 years since I woke up to a blind left eye. For any new readers let me testify to you. April 13th 2014, I woke up blind in my left eye. It came on without warning and I was terrified that my new normal would be both blind and crippled. We also worried the blindness would spread to both eyes. Over the next 9 days it was a roller coaster of emotions. I can not put it all into one post. We were trying to figure out what exactly was happening. Click here to read a synopsis of those days and beyond. Doctors concluded it was most likely Optic Neuritis, the optic nerve was inflamed. The doctor began treating it the best they could but could not promise that my vision would return. If it did return, they could not give time estimation or how much sight I would regain. Throughout the 9 days we prayed and believed God for a miracle. On the evening of the 9th we received a word we felt like was from God. We prayed again and began rebuking the devil and pleading the blood of Jesus over me. From that very moment, my vision began returning. Three hours later I was able to see the E on top of the eye chart. My vision was completely restored over the next several days but I immediately began praising God for a miracle. Now three years later my vision is 20/20!! My vision is better than it ever was! God gave me the miracle we prayed for. The last few days I have re-read several of our blog posts from that scary 9 days of zero vision in my left eye. I can still remember the feelings of fear and uncertainty that plagued me during that period of time. But I will NEVER FORGET the peace of God that carried me through that valley of the unknown. I know God is good no matter what the outcome could have been! I thank God daily for healing me! There is not a way possible for me to thank Him enough. I have shared my testimony from Coast to Coast and I am thankful to be able to share it today. Today I am reminiscing of the Lord's faithfulness. Also I want to encourage you and me to believe God for a miracle in the impossible situations. No matter how long we have to wait remember God is still concerned about us and He is an "On Time God". He will bring us "Through It All". We survived that awful trial because number one, God is good and number two, because the people of God helped us fight the battle through prayer! I am still overwhelmed when I think of all our amazing family and friends who helped us and encourage us, when the light at the end was nowhere in sight. Thank you again to each of you for being our support team. 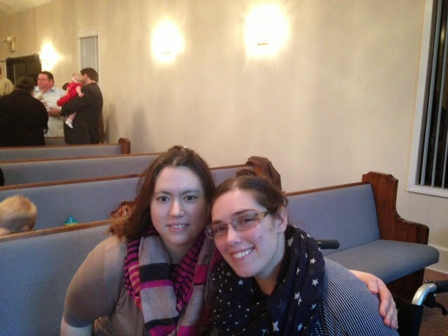 We were preaching that week at Faith Church in Salem, Kentucky for Pastor Phillip Sanders. Bro. Sanders and his church rallied around us and loved on us during that difficult time. 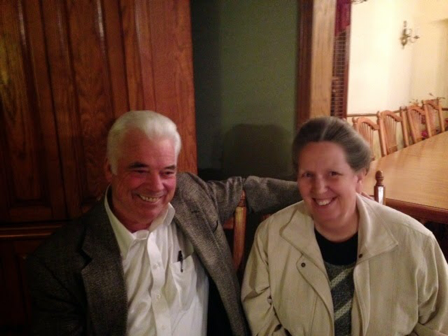 They prayed for me fervently and allowed us to close revival early in order to deal with my blindness at home. They were great to us. Bro. Larry and Sis. Rosemary Landress came to us in Salem. They prayed and cried with us and distracted me when I needed to be distracted. It was an encouragement to have them by our side for a couple days. Thank you, Bro. Larry and Sis. Rosemary! We love you! My friend Brentni Hrapeck was a God send. She got me in to see the Retnal specialist she works for in Paducah, Kentucky. She answer many questions and helped me so much! I will forever be grateful for your help, Brentni! Thanks for stopping by and reading today. I pray you have a fabulous weekend.